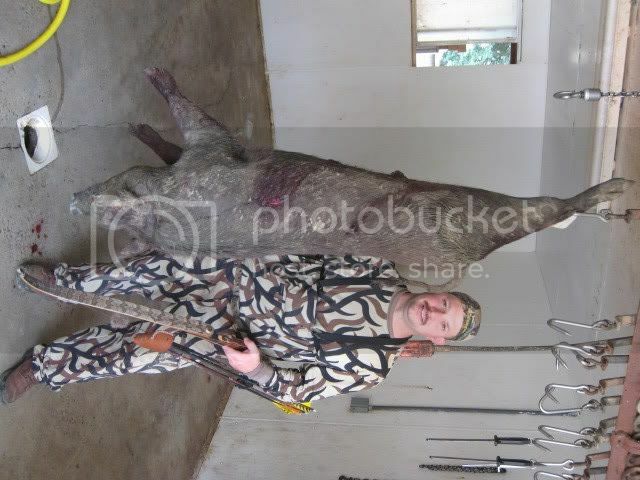 This Boar was taken in Tennessee at The Wilderness Hunting Lodge in Monterey. I used a 59 pound Morrison Recurve and Arrow Dynamics Arrows with a combination of Muzzy Phantoms and Simmons Landsharks for the kill. Nice hog Ron. Congrats again! Pork chops for dinner ?Good job. Sweet......might be adding a hunt like that to my list when i return home. hog killers, you gotta love it! Hey Ron, Nice hog!!! I just recently booked this hunt with Alan for my son and me. We will be hunting with Wilderness Lodge from May 21-23 Can't wait! Any tips or suggestions that would be helpful during our three day stay? No Worries Mike. Alan will take GOOD care of you. LOL You might want to wait on the first kill as there are some Dandys there. I probably saw over 50 different hogs while I was there. Also I would recommend using a SHARP Simmons 2 blade atleast 500 plus grains in total arrow weight and TIGHT and Low Behind the shoulder for a Fast Kill. Best of Luck to Ya'll.